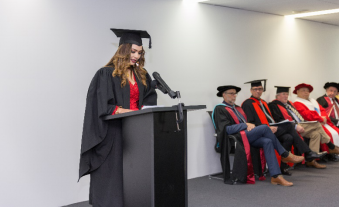 EEI has held its 4th Graduation Ceremony on the 1st of August – over 100 students have graduated since last year’s Ceremony, and we had the great honour to celebrate this this major milestone in our students’ life journey with so many of them! This year, Ms. Sapana Khatri had the great honour of holding a Graduation Speech on behalf of all her fellow Graduates. EEI’s Academic Board and Council Members also gave all Graduates some further advice on how to tackle their future career prospects, and any other challenges life might hold for them. Many friends and family members joined our proud Graduates on this special day, with celebratory drinks & canapés following the ceremony to round up the event! From the Team of EEI we would like to congratulate all our students on graduating from Elite Education Institute. We have no doubt that each and every one of them will extend their excellent skills to the wider community, and be a great ambassador of Elite Education.